Create the user-defined formats and create the data set.The FORMAT procedure creates two user-defined formats that can be used in the crosstabulation template. The DATA step creates the Gov data set. Establish the ODS path and create the White style.The ODS PATH statement specifies the locations to write to or read from when creating the PROC TEMPLATE templates. The PROC TEMPLATE statement, DEFINE STYLE statement, and collection of STYLE statements create the style template White. The ODS NOPROCTITLE statement suppresses the writing of the title of the FREQ procedure. Create the crosstabulation template Base.Freq.CrossTabFreqs.The DEFINE statement creates the crosstabulation template Base.Freq.CrossTabFreqs in the first template store in the path for which you have Write access (Work, in this example). The NOTES statement provides information about the crosstabulation table. Change the appearance of individual table regions. The following DEFINE CROSSTABS statement attributes modify the appearance of individual table regions. Each attribute corresponds to a specific region of the table. To see which attribute corresponds to which table region, see Crosstabulation Table Regions and Corresponding Attributes. Specify a row header, a column header, and a label for the table.The ROWS_HEADER= style attribute specifies RowsHeader as the header for rows. The COLS_HEADER= style attribute specifies ColsHeader as the header for columns. The LABEL= attribute specifies a label for the crosstabulation template. The label appears in the Results window. Create the TableOf header template. The DEFINE HEADER statement and its attributes create the header template TableOf, which is specified by the HEADER statement later on in the program. The TEXT statement specifies the text of the header by using dynamic variables that represent label variables and names. The TEXT statements also use expressions to determine whether row labels and column labels are assigned to the row and column variables. Only TEXT statements that have true expressions are displayed in the output. In this example, both the row label and the column label exist. 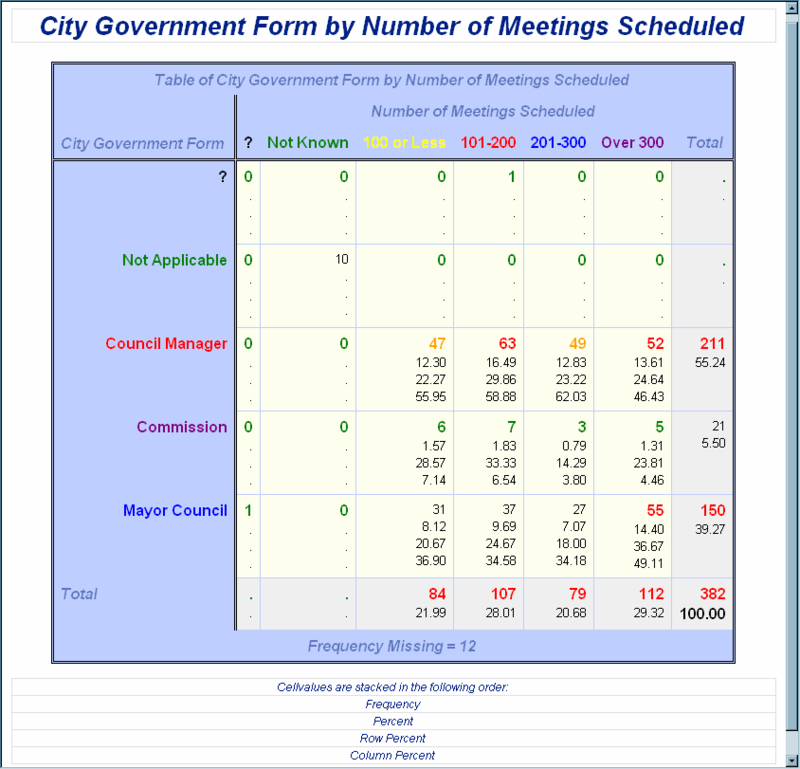 Therefore the first TEXT statement is used and the text resolves to: "Table of City Government Form by Number of Meetings Scheduled". The STYLE= attribute specifies style information for the header. Create the RowsHeader header template. The DEFINE HEADER statement creates the header RowsHeader. RowsHeader is specified as a row header by the preceding ROWS_HEADER= style attribute. The TEXT statements specify the text of the header by using dynamic variables that represent label variables and names. The first TEXT statement uses an expression to determine whether a label is assigned to the variable. If there is no label, the next TEXT statement, which specifies the row name, will be used. 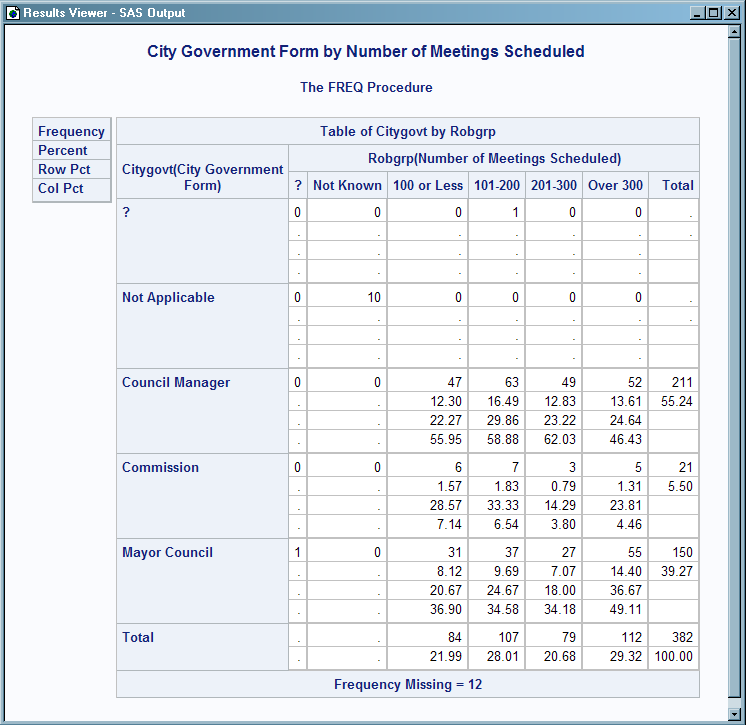 In this example there is a row label for the row variable, so in the output, _ROW_LABEL_ resolves to “City Government Form”. The STYLE= attribute specifies style information for the header, and the SPACE attribute specifies that the current header and the previous header should have one blank line between them. Create the ColsHeader header template.The DEFINE HEADER statement creates the header ColsHeader. ColsHeader is specified as a column header by the preceding COLS_HEADER= style attribute. The TEXT statements specify the text of the header by using dynamic variables that represent label variables and names. The first TEXT statement uses an expression to determine whether a label is assigned to the column variable. If there is no label, the next TEXT statement, which specifies the row name, will be used. In this example there is a column label, so in the output, _COL_LABEL_ resolves to “Number of Meetings Scheduled”. The STYLE= attribute specifies style information for the header, and the SPACE attribute specifies that the current header and the previous header should have one blank line between them. Create the ControllingFor header template.The DEFINE HEADER statement and its attributes create the header template ControllingFor. The DYNAMIC statement declares dynamic variables so that they can be used in expressions. The TEXT statement specifies the text of the header by using dynamic variables that represent label variables and names. In this example, the expression in the TEXT statement resolves to false, so the ControllingFor header does not show up in the output. The STYLE= attribute specifies style information for the headers. Create footer templates. Each of these DEFINE FOOTER statements and its attributes creates a footer template. For the footers to show up in the output, they must be specified by the FOOTER statement. The DYNAMIC statements declare the dynamic variables FMissing and SampleSize, so that they can be used in the TEXT statements. The TEXT statements conditionally select text to use as footers. In the first TEXT statement, the expression is true, because FMissing is not 0. Therefore the first TEXT statement is displayed in the output. In the second TEXT statement, the expression resolves to false, so the NoObs footer does not appear in the output. The STYLE attribute specifies style information for the footers, and the SPACE attribute specifies that the current footer and the previous footer should have one blank line between them. Create the cellvalue definitions.The DEFINE CELLVALUE statements define the values that will appear in the cells of the crosstabulation table. The HEADER= attribute specifies the text that appears in the legend. Because there is no text specified for any of these cellvalues, there is no legend in the output. The FORMAT= attribute specifies the format to use for the cellvalue. The DATA_FORMAT_OVERRIDE=ON attribute specifies to use the format specified in the data component. The PRINT=ON attribute specifies the cellvalue to appear in the table. The CELLSTYLE AS statement uses expressions to set the style element of the cells conditionally according to the values of the variables for the Frequency cellvalue. The _VAL_ variable represents the value of a cell. Therefore, in this example, if the value in a cell is less than ten, then the font color for the DataStrong style element is green. If the value in the cell is between 40 and 50, then the font color for the DataStrong style element is orange. If the value is greater then 50, then the font color is red. Specify which cellvalues appear in the table and the order in which the cellvalues are stacked in the cells. The CELLVALUE statement specifies which cellvalues appear in the output. In this example, all of the cellvalues that were created appear in the table. The CELLVALUE statement also specifies the order in which the cellvalues are stacked in the cells. Specify which headers and footers will appear in the output.The HEADER statement specifies which header templates are applied to your output. The FOOTER statement specifies which footer templates are applied to your output. In order for any of the headers and footers defined by a DEFINE statement to appear in your output, they must be specified by the FOOTER or HEADER statement. Create the HTML output and specify the name of the HTML file.The ODS HTML statement opens the HTML destination and creates HTML output. The STYLE= option specifies template White for the output style. Specify a title and footnote, and suppress the printing of the procedure title.The TITLE and FOOTNOTE statements specify titles and footnotes for the output. The ODS NOPROCTITLE statement prevents the printing of the FREQ procedure’s title in the output. Create the crosstabulation table. The FREQ procedure creates a Citygovt by Robgrp crosstabulation table. Close the HTML destination. The ODS HTML CLOSE statement closes the HTML destination, as well as all the files that are open for that destination.